Item #QG-TF1151: 14Kt. 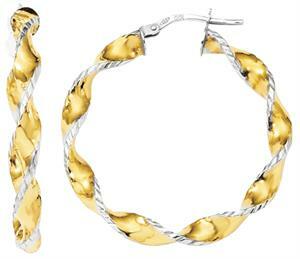 Yellow and White Gold 33mm twisted hoop earrings of 2.39 grams TW with top wires. Item #ARS-112217: 14Kt. White Gold "In and Out" hoop earrings with round Diamonds of .25 Cts. TW and top wires. Item #TBM-E81-EE18871: 14Kt. Yellow Gold "In and Out" hoop earrings with round Diamonds of .48 Cts. TW and post & clip backs. Item #QG-T947: 14Kt. Yellow Gold 4x40mm hoop earrings of 4.23 grams TW with top wires. Item #QG-T936L: 14Kt. Yellow Gold 3x30mm hoop earrings of 2.07 grams TW with top wires. Item #FTJ-307: 64mm Diamond cut 14Kt. Yellow Gold hoop earrings of 3.17 grams TW with top wires. Item #SC-EGBO-0991-X1: Lady's 14Kt. White Gold Earrings with Black Onyx and fourteen bead set round Diamonds of .07 cts. TW. Top wires. Item #CSJ-597: 14Kt. Yellow Gold Hoop Earrings with thirty-six prong set 2.1-2.2mm round Demantoid Garnets of 2.12 cts. TW; Post backs. Item #RC-IT706: 20mm 14Kt. Yellow Gold Diamond cut hoop earrings of 2.39 grams TW with top wires. Item #ARS-104784: 14Kt. White Gold Double Hoop Earrings with round Diamonds of .75 Cts. TW; Top wires. Item #SC-EGDA-5517-X1: 14Kt. Rose Gold Hoop Earrings with eighty-four Round Diamonds of .93 cts. TW set in White Gold; Top wires. Item #ARS-ER2821-WH: 15mm round 14Kt. White Gold Hoop Earrings with fourteen Round Diamonds of .15 cts. TW; Top wires. Item #ARS-127814: 14Kt. White Gold hoop earrings with round Diamonds of .50 Cts. TW and sure lock post backs. Item #TM-E09-932210: 14Kt. White Gold Huggie Earrings with Round Diamonds of .26 Cts. TW; Top wires. Item #SC-ERDA-849-F1: 14Kt. White Gold Hoop Earrings with thirty-two Round Diamonds of .21 cts. TW; Top wires. Item #SC-ERDA-499-F1: 3/8" round 14Kt. Yellow Gold Hoop Earrings with twelve channel set Round Diamonds of .12 cts. TW; Top wires. Item #TBM-33181: 18Kt. White Gold hoop earrings with removable dangles, round Diamonds of 1.95 Cts. TW and top wires. Item #ARS-126453: 14Kt. White Gold Wave Hoop Earrings with Round Diamonds of .25 Cts. TW; Top wires. Item #EST-1627: ESTATE PIECE - 14Kt. Yellow Gold hoop earrings of 2.55 grams TW with top wires. Item #EST-1648: ESTATE PIECE - 14Kt. Yellow Gold 2x25mm hoop earrings of 1.17 grams TW with top wires. Item #EST-1658: ESTATE PIECE - 14Kt. Yellow Gold smooth and textured 30mm hoop earrings of 3.43 grams TW with top wires. Item #SY-031910-14: ESTATE PIECE - 5/8" 14Kt. Yellow Gold earrings with 4x6mm octagon Oregon Red Sunstones of .91 Cts. TW, six round Diamonds (H-J/I1-2) of .15 Cts. TW and post Backs. Item #TW-ER-105: ESTATE PIECE - 14Kt. Yellow Gold Earrings with 6mm round Rhodolite Garnets of 2.01 cts. TW and lever backs. Item #SC-EFFC-1460-X1: Rhodium-plated Sterling Silver Hoop Earrings with two 6mm round Golden Citrine of 1.66 cts. TW; Top wires. Item #FTJ-305: 14Kt. Yellow Gold hoop earrings of 3.23 grams TW with top wires. Item #FTJ-306: 14Kt. 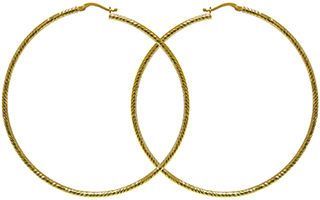 Yellow Gold hoop earrings of 2.92 grams TW with top wires. Item #SS-1528: 18mm Handcrafted Indiri Collection Sterling Silver Hoop Earrings with two removeable Fresh Water Cultured Pearl Drops; Top wires. Item #SS-1571: Handcrafted Indiri Collection 31mm Sterling Silver Hoop Dangle Earrings; Shepherd's hooks. Item #QG-QE12085: Sterling Silver infinity symbol hoop earrings with post backs. Item D&R-25482: 18Kt. White Gold Hoop Earrings with two each channel set 3mm square Peridots, Golden Citrines, Garnets, Amethysts, Iolites & Blue Topaz of 2.40 cts. TW; Post & Clip backs. Item #SHU-E284: 22x25mm Rhodium-plated Sterling Silver Hoop Earrings with 18Kt. Yellow Gold Accents; Top wires. Item #RC-AGLT220: Rhodium-plated Sterling Silver 25mm Hoop Earrings; Top wires. Item #QG-QE808: Rhodium-plated Sterling Silver 3x24mm hoop earrings with top wires. Item #QG-QE815: Rhodium-plated Sterling Silver 4x30mm hoop earrings with top wires. Item #QG-QE800: Rhodium-plated Sterling Silver 2x25mm hoop earrings with top wires. Item #QG-QE816: Rhodium-plated Sterling Silver 4x35mm hoop earrings with top wires. Item #QG-QE817: Rhodium-plated Sterling Silver 4x40mm hoop earrings with top wires. Item #QG-QE4520: Rhodium-plated Sterling Silver 2x20mm square tube hoop earrings with top wires. 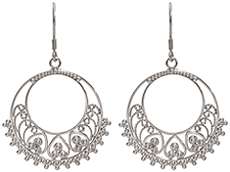 Item #CH-DER-448: 1.25" long Sterling Silver Southern Gates open oval scroll design hoop earrings with post backs. Item #SBC-58833E-SLGO: Samuel B. Collection Sterling Silver flower design hoop Earrings with 18Kt. Yellow Gold accents and post backs. Item #ELY-MHD-50: 1.75" long Sterling Silver 10-17mm Multi-Hoop Earrings of 14.15 grams TW. Post backs. Item #ELY-MUS-E-30: 1.50" Sterling Silver Hoop with Mustang Earrings of 9.31 grams TW; Top wires. Item #SUR-68-631: .75" Sterling Silver Wavy Hoop Earrings of 7.82 grams TW; Top wires. 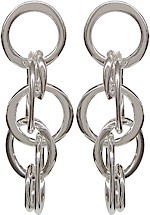 Item #RC-AGWE414: 1 3/8" long Tri-Tone Sterling Silver Multi-Hoop Dangle Earrings; Post backs. Item #TAR-TE378YYS: 18Kt. Yellow Gold Hinged Hoop Earrings with eighty-four bead set round Yellow Sapphires of 1.04 cts. TW; Snap posts.